ysabetwordsmith | Poem: "Between Power and Vulnerability"
Poem: "Between Power and Vulnerability"
This poem is spillover from the March 3, 2015 Poetry Fishbowl. It was inspired by a prompt from rix_scaedu. It also fills the "disability (temporary)" square in my 5-22-14 card for the origfic_bingo fest. This poem has been sponsored by Anthony & Shirley Barrette. It belongs to the series Frankenstein's Family, and is a direct sequel to "Man's True Nature" so you should read that one first. Warning: This poem is nowhere near as gory as the first of the triptych. However, it delves deeper into the emotional and psychological issues. If the latter are more sensitive for you, consider your headspace before clicking through. the dainty wounds at Igor's elbow. marking up my donors; it's crude." "Be my guest," Igor said with a languid wave. until they faded to the familiar faint lines. of all people, and not a male friend of the family. "Csilla, thank you for your attention to detail. want to come along?" Victor said. after that," Igor said as he climbed out of bed. than it had any right to be after yesterday. "I will come, if you don't mind," Csilla said. and that makes him quarrelsome. I may be able to help settle him." "I would welcome the assistance," Victor said. He was rapidly coming to rely on the luxury. and already bickering with his packmates. with any authority outside himself. "You are supposed to stay still," Shandor said. "I don't want to stay still," Fridrik whined. "I want to get out of this damn bed and run." "Do you want to keep that foot?" lip curling into a faint, silent snarl. the higher your chance of a complete recovery. The choice is up to you, now that you're awake." Fridrik gave an aggrieved whuff. over the pulse point at Fridrik's throat. Victor withdrew his hand, not eager to get bitten. it made Fridrik go nearly limp. "Obey," Janika reminded her mate. lifted upward just a fraction. after so much blood loss the day before. "You have already survived the worst," Victor said. "What remains is merely maintenance." of the basic checks, until Fridrik's stomach growled. for a speedy recovery?" he asked the pack. "Whatever we can get," Shandor said. "The more the better," Mircea added. feed him all out of my own portion." The litany hurt to hear. request, but we'll do our best for you. could have anything at all?" "Live food, if we can get it," Janika said. they're easy to keep and to eat." "Mice, rats, squirrels, rabbits, birds,"
I can go out today -- Janika's better at deer." "Fat," said Shandor, "and organ meat." in the oven. What are we discussing?" "Healing foods for werewolves," Victor said. send to Reznik the butcher for those," Igor said. "It's the steaks and roasts that really cost." procuring small animals," said Victor. so it wouldn't raise awkward questions. Fridrik licked his lips. "I like mice." make do with egg for breakfast, I hope." oozing nor swollen tight and shiny. than usual, the way werewolves run hot." into wolf shape and lick over the scabs. "Do you feel strong enough for shift-healing?" Shandor asked Fridrik. "Be honest." "I think so," Fridrik said. He frowned. "My leg hurts very oddly though." and strange until they finish knitting." we tell you it's safe to do so," Victor added. the conflicting demands of man and wolf. "Go ahead and shift," Victor said. help keep the seams intact." with all four paws in the air. need your belly for this." had a better sense of the subtleties. if he'd stepped in the trap as a man. you keep that paw off the floor." onto the floor, then followed him to the bathroom. how stubborn he would likely be." attentively as Igor explained the different options. The two of them conferred in low tones. Mircea slipped off the bed. "I will go mind the cubs,"
she said. "Ena has watched them long enough." head and tail drooping, injured paw held high. reduced to hobbling on three legs. like cold springwater filling him from the heels up. laid down precisely to prevent such a tragedy? settled just as lightly on his forearm. "Softly, my lord," she said to him. "We here are not your enemies." dredged up a faint smile for her. without so much as a gardez l'eau." getting the short end of his temper. It made Victor think less of himself. his emotions about like that. within him that would not just go away. and she set it down in front of Fridrik. He sniffed, snorted loudly, and backed away. through the dish and then licking them. so bad, and it will make you feel better." and lap up the drugged broth. in clumsy circles before settling down. be easier to adjust for shifting back and forth,"
to fit the new lupine shape. in the future and were lucky to have now. looking at Igor, then down at the floor. one of the eggs you boiled up ..."
Ena, thank you for bringing it up." he made no move to eat. feel like doing much of anything. "You know, I make a terrible patient myself,"
help Fridrik feel less alone. The black wolf rolled his eyes. "He really does," Igor said earnestly. "So do I -- in fact, most doctors do. even when we need to do so." must find their own ways of dealing with it." pushing the empty plate with his tongue. Csilla smiled as she passed the plate to Igor. receiving a shy nod in reply as she left. had learned such skittish behavior. Fridrik company, if you don't mind," Csilla said. "I think I should not like the village today." was likely to get for such a painful topic. to come along, but you are in no shape for it,"
he said. "Who would you send in your place?" to Igor who gave a startled gasp. after we have eaten breakfast." and headed down the stone steps. deeper things still that he did not wish to examine. a reassuring pressure at the small of his back. "I just kind of want to kill someone for this,"
Victor admitted. "First the boys, and now Fridrik!" Igor sighed. "I sympathize with your outrage," he said. on village management and the lord's justice." "You're right, of course," Victor said. onto everyone with a bit of sensitivity. me adding to the mess when I know better." to have someone's hide for this,"
Victor's back just behind his heart. That helped thaw the ice a bit. a rasher of bacon and forked it onto a platter. when Adam plainly loved it and it wasn't hurting anyone. of ferocity for both them and the permanent wolves. as they had with his. "There has to be a balance between power and vulnerability. That's something I feel I have in my own life, something I struggle with and - on a good day - like about myself." Jealousy is an emotion of perceived threat or vulnerability to loss. It has various causes, and can wreck relationships. There are healthy ways to handle jealousy. Polyamory involves intimate relationships with more than one person, not all of which are necessarily sexual. There are tips for incorporating another person into an established relationship. Csilla's connection to her donors is both intimate and sensual, but is not sexual with Igor or Dénes. Power can be used for good or evil. Appropriate use of power is an important quality in a great leader. The werewolves have a delicate balance of power in their patchwork pack. Victor and Igor have their own challenges in power dynamics. Understand how to gain influence and use it properly. Vulnerability relates to different soft spots for different people. While helpful in hostile conditions, it can cause problems under more favorable ones. Vulnerability can be a sign of strength instead of weakness, and it aids intimacy. In this instance, the more vulnerable Fridrik feels, the more defensive he gets; the only person he can submit to willingly is his mate. There are ways to build rapport and to be more vulnerable in relationships. Victor and Igor cleverly capitalize on this by talking about their own weaknesses. Consent refers to choices made freely with full knowledge. A problem is that sometimes people's consent is impaired when they are sick, injured, drunk, etc. Trauma survivors may also have difficulty thinking logically. This is a huge issue in health care, where it's quicker and easier to violate people's agency than deal with someone's complex psychological and physical needs. Abusing a patient's agency and emotions, however, contributes to the ruinously high rate of PTSD coming out of some health care tracks -- and it does absolutely no good to exchange one life-wrecking, potentially fatal condition for a different one. Supported decision-making respects people's integrity and freedom while shoring up areas they can't handle fluently alone. Here everyone agrees on the same goals (keeping Fridrik's foot attached to his body, and getting him well) but they are somewhat hindered by his psychological damage from previous conflicts. For the most part they solve this by removing obstacles and coaxing gently so that Fridrik reaches a point where he can go along with the good advice he's getting. Janika can get away with being a little more forceful because she's his mate. Teamwork and respect mean that Fridrik will come out of this with his body and relationships intact, hopefully making it a little easier on him the next time something goes wrong. Diet can greatly improve recovery. There are foods to replace lost blood, knit bones, and heal injured muscles. 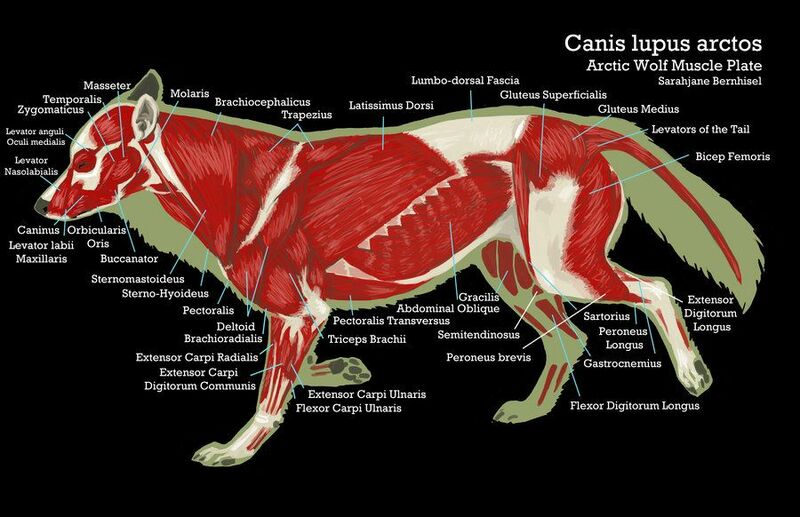 See the muscles and bones of wolf anatomy. Poisoning wolves has long been a popular method of killing them. Historically, plants such as wolf lichen and wolf's bane were used prior to synthetic poisons. Fridrik is touchy about food additives because of this. He knows that it's irrational in this context -- that his friends aren't going to poison him -- but that doesn't make his instincts stop howling at him. So it takes a lot of work to overcome. Anger can have negative effects on self and others. Victor's father wasn't exactly violent, but had a lot of anger issues, which has left Victor sensitive in this area. There are tips for self-control and anger management. "Gardez l'eau" means "beware of the water" and comes from French, appearing in assorted versions. Chicken, egg, and rice is one kind of homemade cat food. An icebox is a wooden cabinet which holds a block of ice to chill food. They were popular long before refrigerators and freezers were invented. I don't know why the earliest online references only go back to the 1800s, as icehouses date back a lot farther. Maybe it's just the fancy cabinets and long-distance distribution they're focusing on. Anyhow, the castle's icebox is a big fancy walnut model similar to this. The top two corner doors hold blocks of ice; the rest have shelves behind them. Special tanks capture the icewater as it drains off, so that it may be used for other purposes. EDIT 3-27-15: librarygeek has helpfully added references for the hisotry of icehouses and a Babylonian icehouse. Loss of appetite can happen with almost any illness or injury, making it difficult to tell whether it's just a side effect of what already happened or a warning of some fresh hell just arriving. Know how to tempt someone to eat when they don't really feel like it. Ena doesn't even know that's what Igor was doing with the cat food; she just knows that it sounded delicious and like something that Fridrik could be coaxed into trying. It is well known that doctors make bad patients. This can be because some of them truly are arrogant and impossible to deal with, but it's also because almost none of them will tolerate the kind of manipulation and abuse routinely foisted on people less able to fight back. They are used to having control of their own lives and will not relinquish it without a struggle. Practices which respect agency are better tolerated, so a place with a lot of doctors as patients is likely to offer excellent service. Wolf communication includes a wide range of body language and vocalizations. An adult bringing back prey for the cubs will often make a soft woofing noise, which is what Ena uses here. Justice includes an awareness of appropriate force and punishment. When either is out of proportion with the offense, either too harsh or too weak, that is both unjust and ineffective for managing behavior. Wolves interact with each other and have complex social behavior. They show affection both physically and vocally. Feeding appears both in cub raising and dominance/submission dynamics. It can be either a display of care for a lower-ranked wolf (good providers are popular) or a way of currying favor with a higher-ranked wolf (subordinates may use food gifts to defuse tension). The triptych concludes with "The Noblest of All Animals." I love this 'verse and every bit you show us of it. Governor's Palace in Colonial Williamsburg has one, paragraph above "A Busy Complex" heading: http://www.ultimatehistoryproject.com/ice-house.html The tours and documents state that perishable items were kept in the ice house, until being brought in for use or serving. The ice box, in the kitchen, seems to be a later product of having regular ice sellers, with a regular route, and not the wealthiest arranging large shipments to pack their ice houses. Thank you! I have added these references. I figured that the prevalence of iceboxes came from shipping ice. But rich people have had it for a long time, and would put it up in various containers. The Babylonian reference reminded me of this poor man's refrigerator. I've encountered accounts of the Romans making ice in North Africa. And apparently the Egyptians had a different trick. The roman one involved digging a deep hole and insulating it with lots of straw. You place a bucket of water in the bottom. During the day, you have a cover over the bucket lots of straw over that, and a further cover over the hole. At night you remove the cover over the hole, dig out the straw over the bucket, and take the cover off the bucket. With the clear skies and low humidity, the heat radiates out into space during the night, and the water doesn't heat much during the day because of the insulation. After a few days, you have a bucket of ice. This isn't suited for making *large* amounts of ice, but it will work for smaller amounts. Modern materials (say styrofoam insulation and some aluminized mylar to help reflect heat) and it'd be more efficient. The Egyptian trick involved a room with lots of pillars and open to the sky. I forget details, but frost would form on the lower parts of the pillars before sunrise. This would quickly be scraped off and used to make small amounts of flavored ices. Sort of an Egyptian sno-cone. Human ingenuity, ya gotta love it. I don't have enough brain cells to compose a more detailed reply at the moment, but I like this, and the previous one, a lot. Thanks for letting me know you read it. Third piece is up! I just read this one, out of sequence, having read the concluding part earlier. Ohh, good, again and still. As a kid I lived for a number of years with my mother's parents. I remember well noticing some of Nana's peculiar (to me) locutions, including "icebox" for the refrigerator. She was born in NYC in 1888, to parents who had immigrated from... Russia, I think. I'm glad it works on the rebound. I still say "frigidaire" sometimes, got that from my grandmother.